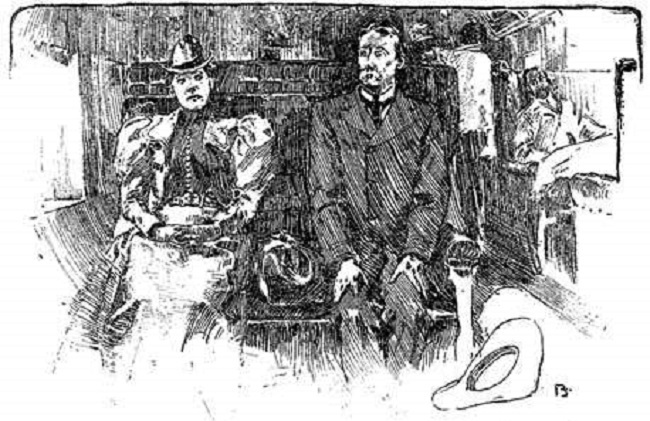 “He sat with a hand on each knee, like a man waiting in a barber’s shop.” Illustration from the original publication of “The Bride Comes to Yellow Sky” in the February 1898 issue of McClures’s Magazine. Heavily and increasingly in debt, Stephen Crane wrote a large number of tales and sketches in quick succession during the years 1897 and 1898, yet his desperate pace did not keep him from publishing four stories that are considered masterpieces of American short fiction: “The Open Boat,” “The Blue Hotel,” “The Bride Comes to Yellow Sky,” and “The Monster.” Although he remained famous primarily for The Red Badge of Courage, Crane and his circle of friends acknowledged the transformation of his art (if not his pocketbook). Just before “Yellow Sky” was published, he wrote from London, “All my friends come here say it is my very best thing. I am so delighted when I am told by competent people that I have made an advance.” The advance, sadly, was short lived; in two years he was dead of tuberculosis at the age of twenty-eight. Note: A drummer is a traveling salesman. The great Pullman was whirling onward with such dignity of motion that a glance from the window seemed simply to prove that the plains of Texas were pouring eastward. . . . If you don't see the full story below, click here (PDF) or click here (Google Docs) to read it—free! Well, that was a bizarre ending. I was expecting Wifey to "drop" Scratchy. Well...O.K. I guess this is a story depicting the changing of the old West; yet it seems more like the ending of a longer story that preceded this. I didn't feel I knew the bride and bridegroom well enough to take the ending seriously. I,ll remember mostly the shooter and the dog. At least there was some conflict developed in that relationship. Nevertheless, I consider Stephen Crane a great American writer; this was just a bit lacking as an engrossing story. Stephen crane is a naturalist, Naturalist tend to focus on the inanimate objects rather than the characters them selves, the objects tell the stories. There are many motifs that re occur in the story. It is also a satire, and you are right about the end of the old west, and the end of the romantic era. The story isn't lacking its just a little deeper and you're skimming the surface.